The OSCILLA™ is a fully-automatic digital blood pressure measurement device that delivers fast, reliable measurements of systolic and diastolic blood pressure, as well as pulse frequency. Using OSCILLA™, you can quickly and easily check your blood pressure in the comfort of your own home. The easy-to-use design also stores up to 18 prior measurements with averages so you can track your blood pressure readings over time. Plus, the new OSCILLA™ InflateRead™ technology cuts measurement time by 40%, so just a few minutes a day can make the difference. The bold design of the OSCILLA™ features one-touch fully-automatic operation and an integrated cuff compartment for elegant desktop display. Automatic-off mode conserves battery life. 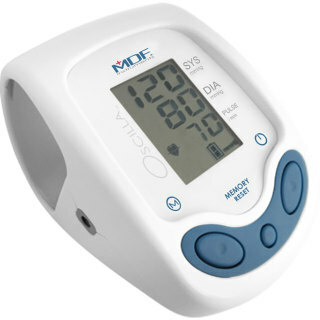 An extra-large angled digital display ensures that blood pressure and pulse readings are easy to read. Battery meter indicates remaining battery life. OSCILLA™ takes measurements during cuff inflation for comfort, speed, and accuracy without excessive pressure. Readings are 40% faster, and over-inflation and the need for re-pumping are eliminated. Resistant to abrasion, chemicals (chlorine and peroxide), and moisture, the adult Velcro® cuff is constructed of high-molecular polymer nylon, and features a D-ring for ease of use and an arterial indicator for accurate placement. Sized to meet American Heart Association recommendations, the artery indicator label and index range further ensure proper cuffing for correct arterial compression. The single-tube seamless inflation bag is constructed of crack-resistant, non-sticking, high-density hypoallergenic latex-free PVC.